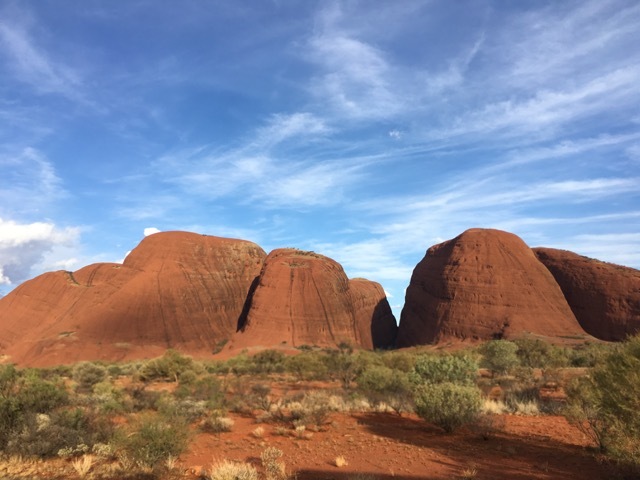 If there is one place you should try to see its Ayres Rock and the Olgas they are so majestic and beautiful. It is 348 meters high and 3.6km long. They say that what you see is only a small part of the rock it goes down about 5 to 6 kms more and it use to be on its side and had turned over time. I came here 18 years ago and climbed the rock this time due to vandals the rock climb is closed they cut the chain that helps you up the first part of the climb it will be weeks before it reopens. You can do the walk around the base which is 10.6 km loop and there are info boards all the way around. At The Olgas or Kata Tjuta as its called there are 36 domed heads the highest 546 meters and there is The Valley of the Winds walk due to the heat unless you were there early it closes at 11am or once the temperature reached 36 degrees.The temperature has been between 35 to 40 degrees each day so Miss Elly stayed in the van in the air con most of the time while I ventured out. We had a few storms come through each afternoon which helped cool it down. On arriving I discovered that my wiring had burnt out from the electrical plug from the car to van so I had to have it repaired I was told I was very lucky it was close to starting a fire from wires rubbing together feeling very blessed it didn’t happen way out on the Great Central Rd a long way from anywhere. 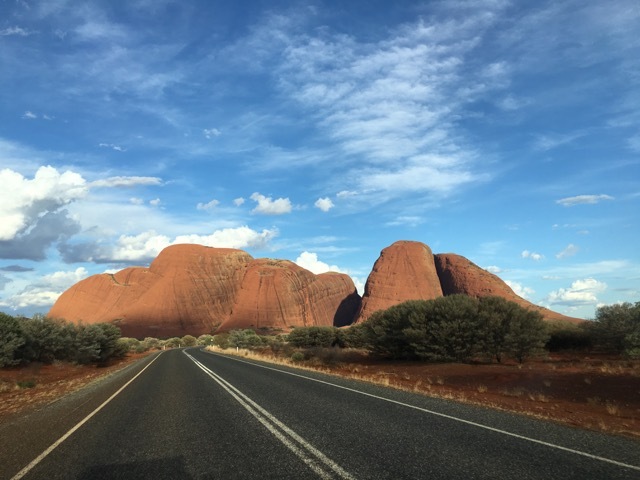 I also took a sunset helicopter ride now that was fantastic you can really appreciate the size of Uluru from the air and my pilot Adrian was from Deniliquin and grew up a few houses down from my friend Jules. The more I travel the more I realise how small this world is.